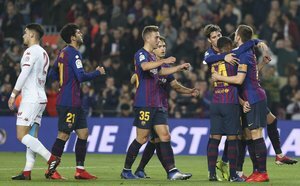 Atletico Madrid, Girona, Real Sociedad, Sevilla, Villareal and Real Valladolid are, along with Barcelona, the seven teams to reach the Copa del Rey last 16 on Wednesday. They beat Sant Andreu, Alavés, Celta, Villanovense, Almería, Mallorca and Cultural Leonesa respectively. On Tuesday, Valencia, Getafe, Leganés and Espanyol all made it through as well. So far, 11 La Liga teams are in the hat. On Thursday, five more teams will join them. The draw for the last 16 will take place on Thursday in Madrid at Las Rozas at 16h.